Space in print media is limited. On the web the real estate is infinite. Since I am an all but retired/obsolete/redundant magazine photographer and sometime writer I can take advantage of that real estate with my blog. I can write what I want, write at whatever length I want, put the pictures I want (within my standards of contemporary aversion to showing bits and pieces) without fear of an editor, art director or some unbearable fact checker thwarting me. That’s because I am all the above including that of “publisher”. I use those double quotes because I am old-fashioned and I don’t believe that anything can be truly published unless the results can stain your fingers. Today’s Georgia Straight (which does suffer from limited space in its printed form) features five of my photographs that represent the Straight’s annual Fall Arts Preview. They are of five pairs of artists, representing music, comedy, dance, acting and the visual arts. Every year I choose a theme. This year’s theme is not explained so I will do so but at length. I think the circumstances behind the use of that 1948 Tatra motorcar are interesting. Space in the Straight prevented them (perhaps?) from explaining the theme. My journey to Tsawwassen (where the Tatra resides) began in 1961 when I saw Phil Karlsen’s espionage film The Secret Ways with Richard Widmark. At the time and for many years I indulged in my pre-literary/un-highfalutin taste in novels. I consumed all of Alistair MacLean’s thrillers. I will point out here that at least 16 of Maclean’s novels became films (The Guns of Navarone is the most famous of them). The Secret Ways featured (I noticed!) a big, black aerodynamic car that like a killer whale had a prominent dorsal fin in its rear. 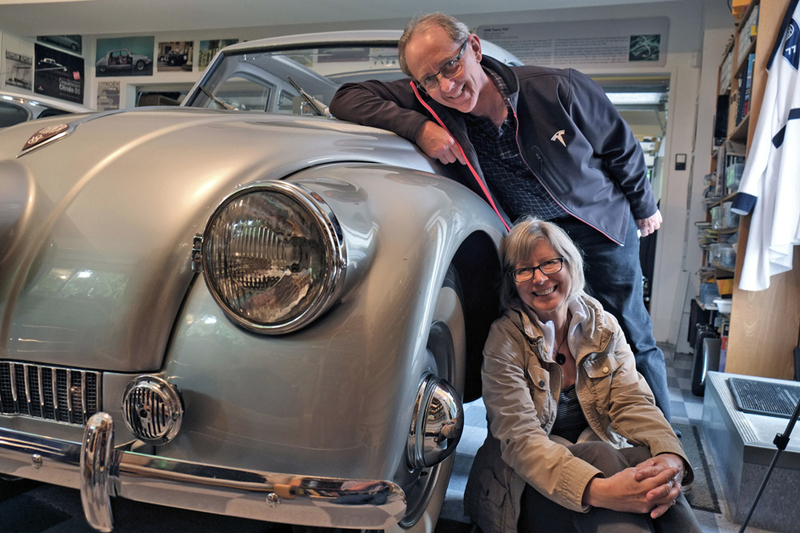 I fell in love for the car but never saw another in my life until I met up with Gary Cullen’s 1948 Tatra a couple of weeks ago in Tsawwassen. 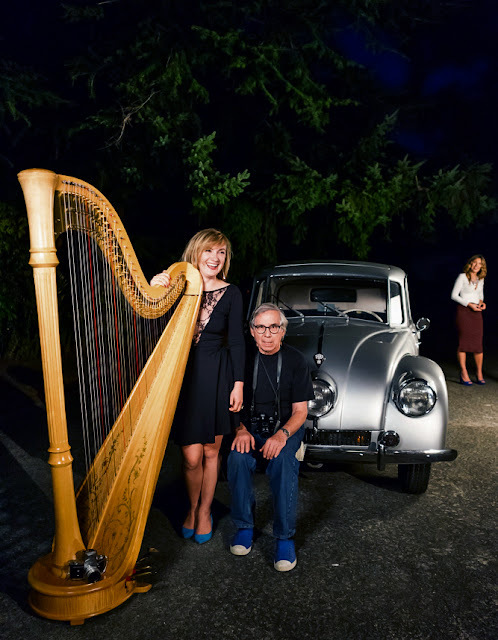 The Tatra has been in my mind for a couple of months ago as there was a lengthy spread and article about Cullen’s car in the Vancouver Sun (alas the pictures have been taken down!). I had to find a connection between Andrea Stefancikova’s curves and knowing that she was born in Bratislava, Slovakia I compared her to the wondrous Tatra made in what used to be Czechoslovakia. A week later I received a phone call from the Straight’s Arts Editor, Janet Smith giving me the Fall Arts Preview and asking me what my theme would be. If you have gotten this far you will be able to connect the dots. Gary Cullen’s talents included a recent past of repairing mechanical cameras (not digital ones with those unromantic circuit boards shrouded by poly-carbonate plastics). In fact his onetime establishment, Brighouse Camera Repairs in Richmond repaired my Mamiyas. When I went into Cullen’s house I noticed a glass case with immaculately restored German cameras. One of them was made in Dresden which after the war became the Russian Occupied Zone. The Exakta was one of the first (if not the very first) single lens reflex plus for reasons that nobody has ever revealed to me had its shutter release on the left hand side of the camera. Great for left-handers but if you were not a southpaw that would mean that you would have to focus with the right hand. With Cullen I concocted the private joke of including the Exakta in some corner of every one of the photographs for the Straight. What is its significance? 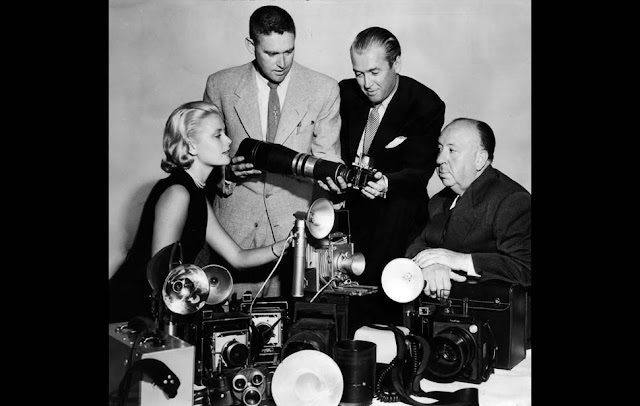 It was the camera model used by Jimmy Stewart in Rear Window to spy on the mysterious man on the other side of his apartment ( Raymond Burr). Cullen informed me that the long lens mounted on the Exakta VX in question was a Kilfitt Fern-Kilar f/5.6 400mm lens. One pair of artists could not make the trek to Tsawwassen. These were artists Fiona Ackerman and Steven Brekelmans. 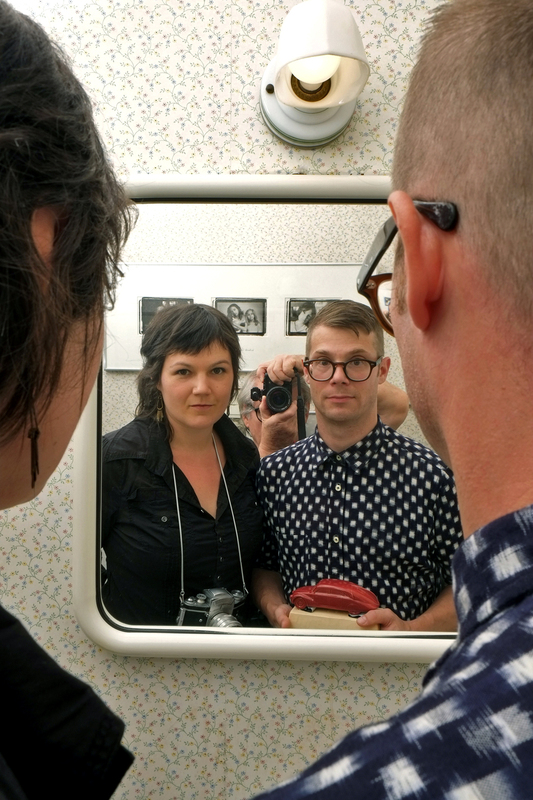 In Ackerman’s web site I found this which gave me the justification to include a mirror (my guest bathroom mirror) in the photograph. In Brekelmans’s site I found this. I asked Brekelmans to bring one of his wooden gold bars to use it as a base for one of Cullen’s antique models of his Tatra. All along besides the terrible problem of navigating around that Deas (George Massey) Tunnel my standing frustration was the fact the Straight has always insisted that the photographs used to illustrate the Fall Arts Preview must be vertical. The Tatra as seen from its side is very horizontal. But for this assignment I had an excellent assistant, Cullen’s wife Karoline. She seemed to know at all times where I had deposited my camera or light/flash meter and warned me of many mistakes I almost made but she caught them in time. The shots of a the dancers presented me with a problem. I needed a different angle from the one of the comedians. I thought the dorsal fin would be a good place but I could not do that twice. 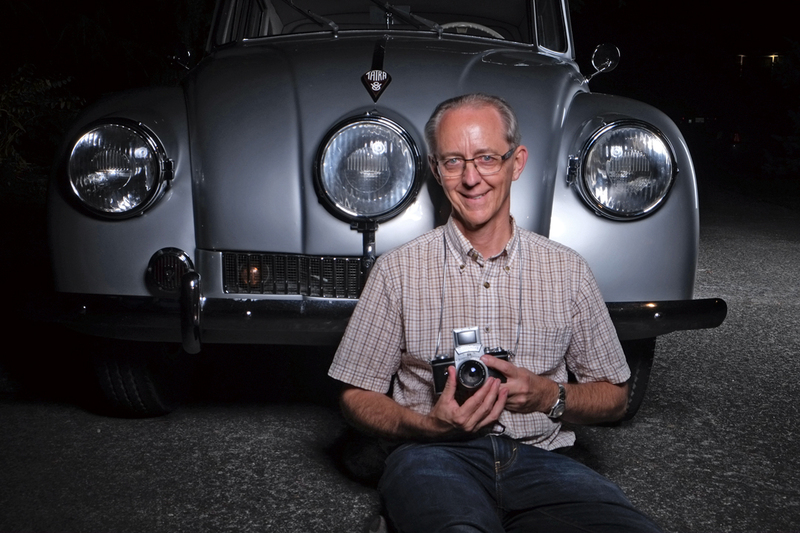 On the first shoot, my friend Paul Leisz (a former resident of Tsawwassen) came along. It was he who suggested the suicide door angle. Before I had arrived I had come up with the idea that I wanted von Riedemann barefoot. Leiz's idea worked just fine with that. For the night shots I asked Cullen if we could turn on the car’s three headlights (the center one turns with the steering wheel). To his dismay two were burned out. 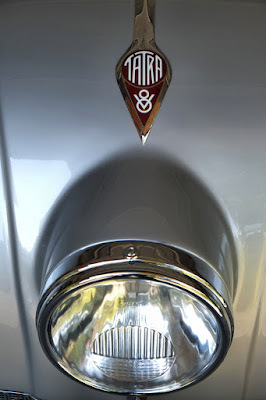 But our persnickety Tatra owner produced two brand new but antique bulbs whose brand name was Tesla (the old Tesla, the Yugoslavian electrical scientist). 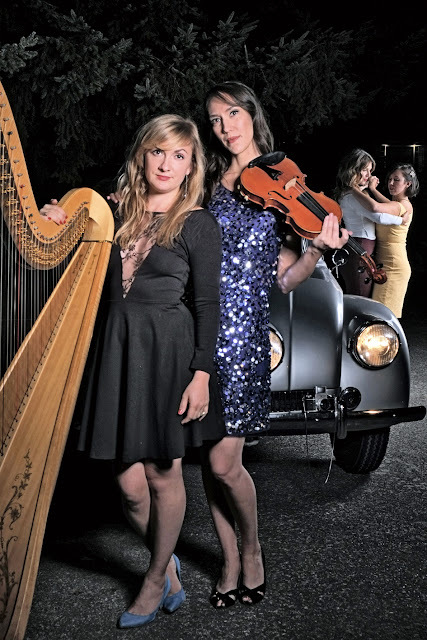 In the dancers' photo the light coloured car in the background is Cullen's own Tesla. The Tatra is a "1948 Tatra T87" Built from 1936-1949 in Czechoslovakia. 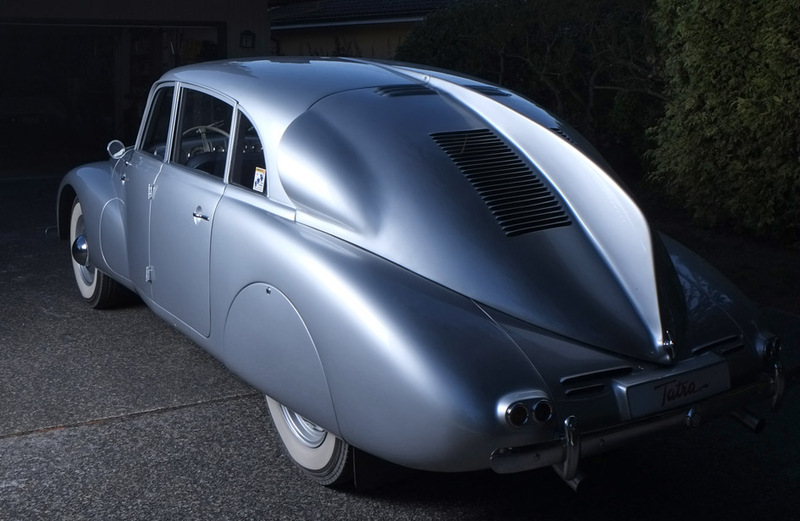 Technical design by Tatras Hans Ledwinka, streamlined body design by Paul Jaray (who did the aerodynamic design for the German Zeppelin Airships). The car was tested for wind resistance in the Zeppelin wind-tunnel. Tatras were the first serial produced scientifically designed aerodynamic cars. It has an air cooled overhead cam V8 engine in the rear, all independent suspension, rack and pinion steering and a central lubrication system with no grease fittings. Top speed was 160km per hour. Cullen further informed me that the original VW Beetle was really a small Tatra. 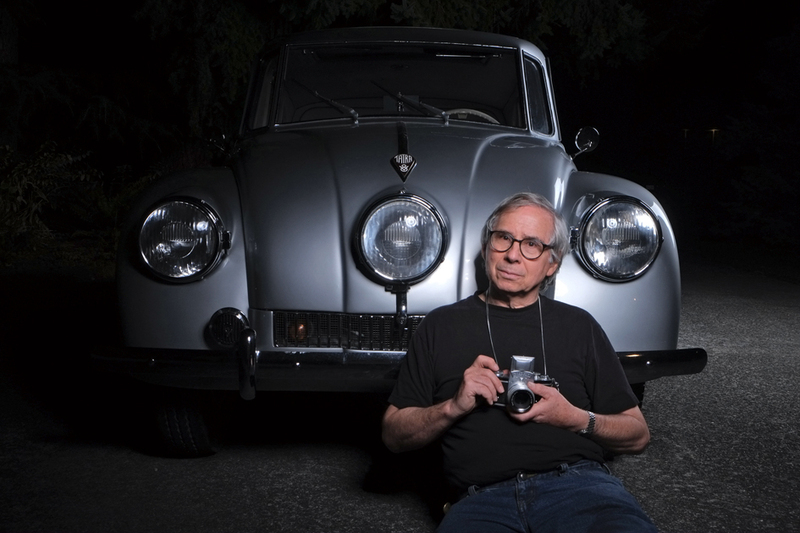 Tatra successfully sued VW. More on this here. Tatra now only manufactures trucks.